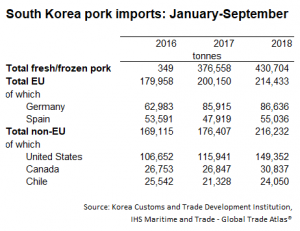 Despite the expectation that South Korean imports of fresh/frozen pork would slow as the year progressed due to increased domestic production, imports have actually increased by 15% on the year, to 430,700 tonnes in the year to September. While increased imports were recorded for all key suppliers, the US remained the dominant single supplier of pork to South Korea. US pork imports reached 149,400 tonnes valued at $408 million, accounting for 35% percent of all imports by volume and 31% percent by value. Meanwhile, imports from the EU saw a smaller increase, up 7% on the year. 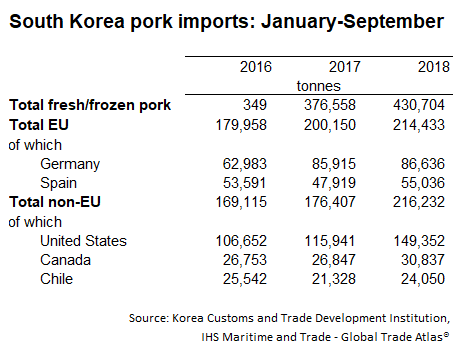 Despite this relatively small increase, EU pork still accounts for half of South Korea’s total pork import volumes, at 214,400 tonnes. With growing imports of pork, South Korea could face challenges in the year ahead because of overachievement by the domestic Korean pork industry. According to the USDA, Korea’s swine herd is expected to continue to expand next year to support higher pork consumption. Demand is being driven by processed meat producers’ increasing use of domestic pork and growing consumer demand due to concerns over the safety of imported pork. Furthermore, low feed prices are expected to continue to support profitability in the domestic sector. Consequently, going forward, sector profitability is likely to drive increased production, reducing import demand. With US production benefiting from slightly more favourable access conditions to Korea compared to the EU, due to the KORUS agreement, it is likely that US will maintain its market share, possibly limiting growth opportunities for EU exporters.